What do you get when you combine an award winning pianist, one of the best pianos available, situated in one of the finest recording spaces, and one of the most important works composed for the keyboard, regardless of which instrument happens to be indicated? Well, the answer is quite complex, but the short answer is The Open Goldberg Variations, as performed by Kimiko Ishizaka. The Goldberg Variations is the kind of piece that any serious lover of music by Johann Sebastian Bach takes notice of whenever a new recording is released, if only for the perverse desire to make the inevitable comparisons with their favourite recordings that are inevitably found in one’s library. That said, The Open Goldberg Variations adds a new twist by virtue of the fact that Ms Ishizaka has chosen to release her recording as either a high quality Mp3 or Flac file, available to download for free online. Yes, you read correctly; this recording is free: a full length performance of the Goldberg Variations, including all of the repeats, for free ... and believe me, this is one recording that you cannot afford to miss. You can also listen to the piece in its entirety from their SoundCloud posting, from the Open Goldberg page (here), where you can also find the download links to the higher quality files. As well as making a new recording of the Goldberg Variations, and releasing that to the public under a Public Domain license, The Open Goldberg Project went about creating an entirely new score for people to access, using an online engraving, or notation, program called MuseScore. The new score is quite clean and very easy to read, and if you are interested, MuseScore is free to use, so you may prepare your own musical scores online if you do not have access to another software. You may see the score here. After the score, the thing that the pianist needs the most is, of course, a piano. The choice of instrument for this project has a great deal to do with the success of the performance for a number of reasons, not the least of which being that the sound reproduction afforded by the instrument is of such a high quality, the listener is drawn into the performance from the opening notes of the Aria. The instrument used in this recording of the Goldberg Variations was supplied by the great Austrian piano builder Bösendorfer. 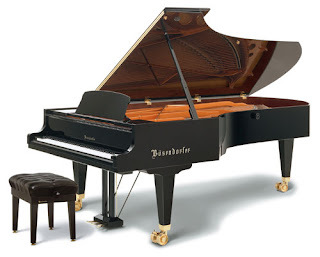 They supplied Ms Ishizaka with an Imperial Grand Model 290SE, which comes with the revolutionary CEUS recording system invented by Wayne Stahnke, who brought the technology to Bösendorfer in 1978. Unfortunately for Mr Stahnke, the technology was never patented and is now more widely known as it appears in the Yamaha Disklavier, but the CEUS system was the first version, and remains the superior form of the technology. Essentially, CEUS turns a grand piano into a giant reproduction device; it allows a pianist to create an exact duplicate of their performance, without regard for the extraneous sounds that may take place during the performance. So, if a pianist is in the midst of a great performance and somebody sneezes, they do not have to stop and “retake” the movement – the sneeze would not register with the CEUS equipment, only the music is picked up by the instrument. This performance of the Goldberg Variations was recorded using the Bösendorfer’s ability to faithfully reproduce every nuance of the performance that Ms Ishizaka set down, and there were plenty of nuances to capture. From the opening of the Aria it is obvious that this is going to be a special recording; the tempo is just right: not too slow and not too fast. So many pianists have a tendency to want to milk the emotional content of this Aria, but they fail by making their performances overly sentimental, sounding as though it was composed in the 19th century rather than the Baroque period. Ms Ishizaka, on the other hand, takes the listener by the hand and, without giving in to mawkishness, makes us genuinely anticipatory of the impending 30 variations. When you listen to Kimiko Ishizaka play the Goldberg Variations it is very easy to begin making comparisons to such luminous performances as those given by Glenn Gould for the way she isolates individual voices within each variation and alters her articulation in order to bring out specific voicings among the parts. This is something that many pianists do not do, but for Gould was famous. Ms Ishizaka brings out individual voices throughout the variations with a deft mastery that speaks of her tremendous technical prowess. One of the wonderful things about the Goldberg Variations is the progression of the work itself, the way in which Bach organized his piece using different compositional techniques from one variation to another, leading invariably to the “canons” that occur every third variation. Bach begins with a canon at the unison, then a canon at the second, and ultimately ends with a canon at the ninth before winding up the piece. The technical challenges for the pianist playing these particular variations are numerous, but you would never know that there was anything difficult about the piece for the way Ms Ishizaka performed the piece: her performance has a sense of ease to it that gives the impression that she could perform like this all day, without having any fatigue. The final variation of the piece, before the restatement of the Aria, is a Quodlibet, which is a piece of music that is made up of several melodies, in counterpoint. For many this is the highlight of the composition, and Ms Ishizaka did a magnificent job leading the listener to a point where this variation fit in perfectly. Her choices of tempo throughout the work never seemed inappropriate and the execution of ornaments on the repeats was also quite refreshing. Unfortunately, some players simply play the repeats in Baroque music, losing an opportunity to make something out of the repeat, which is exactly what Ms Ishizaka did in this brilliant recording. Every repeat was seen as an opportunity to express another element of her overall vision of the piece, and it is a very well thought out vision, indeed. The only negative thing that might be said of the recording would be of the SoundCloud posting – and I stress – I have not listened to the higher quality download so I cannot state whether or not this applies to the fully mastered album (having posted lower quality files online and to SoundCloud myself, I would expect no) is that at the end of the 27th variation – track no. 28 – there is a bit of a glitch where the audio does not go to the very end of the track but instead jumps to the next track. It is a very minor thing, but – when you consider the quality of the rest of this album, any blemish is noticeable. On the whole, Kimiko Ishizaka has produced an exemplary performance of an iconic piece and, by making it a Public Domain project, she may well have created a truly definitive recording for the masses – a recording that will satisfy the most discriminating listener, even those who are willing – and able – to purchase the expensive alternatives from record stores or from online. Angela Hewitt has always impressed me for her ability to make Bach’s music come alive; after listening to this recording of the Goldberg Variations by Kimiko Ishizaka it is very easy to see that there is going to be another album added next to Angela Hewitt ... and Glenn Gould. Ms Ishizaka is in very good company indeed.